Campers, this page is just for you, whether you're a veteran of camp, or this will be your first summer! 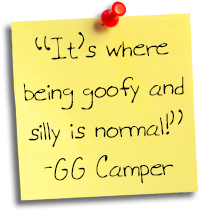 Read about other camper's experiences at Geneva Glen! Check out photos from the summer! Meet the Knighthood II King and Queen of the Glen! Get your update in the GG Breeze here! Geneva Glen offers campers a wide range of daily activities. The program includes activities geared to the physical, mental and spiritual self: hiking, exploring, horseback riding, swimming, archery, climbing and challenge courses, music, drama, arts and crafts, pageantry and ceremony. Geneva Glen designs each theme to encourage and challenge campers and staff to recognize and honor the qualities of honesty, integrity, courage, patience, respect, enthusiasm and responsibility. Founded in 1922 as a character development and leadership training program, Geneva Glen Camp is a private, non-profit organization and we are proud of its more than nine decades of successful seasons. Here, you can meet the horses and learn about our barn program!